Carers Trust Heart of England will be out and about in Coventry over the whole week. Come and visit us at one of our stands, or tell your friends to come, to find out more about the services available and support for carers in Coventry. All the stands are open 10.00am to 4.00pm. 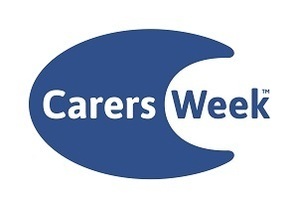 CarerSmart is a club run by Carers Trust, the UK’s largest carers’ charity, and is open to carers, people with care needs, staff and volunteers across the Carers Trust network of which Carers Trust Heart of England is a member. and much, much more . . . there really is something for everyone. All Coventry GPs will now be able to link people affected by dementia to the ten Coventry GP Dementia ‘Pop-up’ clinics. 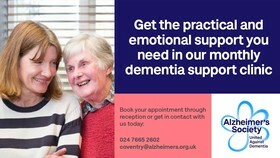 This expansion of the Coventry and Rugby CCG funded project means that people living with dementia and/or carers can book an appointment to speak face to face with a Dementia Navigator at a local ‘host’ practice.. These specialist workers from the Alzheimer’s Society can provide information and support around a number of dementia related issues including diagnosis, all aspects of living with dementia, local services, legal rights and welfare benefits. In the two months the clinics have been up and running, 41 appointments have taken place. Phone in yourself or ask the receptionist to book you an appointment. Look out for the posters in your GP Practice or call the Alzheimer’s Society on 024 7665 2602 for more information. Prior to its official opening later this month the Arden Grove Extra Care Development in Tile Hill has begun to take its first tenants. Arden Grove provides a purpose built Dementia Centre with accommodation for 33 people with dementia offering one bedroomed apartments with a kitchen, shower room and lounge area. The development is be made up of 3 clusters, one per floor, and each with 10, 11 and 12 apartments. In addition to the apartments each floor has a domestic kitchen, dining room and lounge area. Assisted bathrooms are located on each floor. Accord who run the scheme have used their experience of dementia friendly design and the Stirling Gold Standard to influence both building design and interior design decisions. Care and support is provided in line with the Eden Alternative Philosophy of care and the Green House model through the design of the building and the development of the staffing structure. The Green House Model, as part of the Eden Alternative, means to create the same feeling and experience of living in a real home, whilst in a care setting. The care setting is designed in small clusters, keeping it flexible and maintaining a homely feel. The comfort and dignity of private apartments are combined with the family-like atmosphere of open common spaces. Access to the scheme is through assessment by Adult Social Care. Eligibility criteria apply. For further details please contact Richard Limb Commissioning, Commissioning Officer, on 024 7683 2852.